Alicia Keys & Swizz Beatz Pregnancy & Wedding Confirmed? It looks like reps for both singer Alicia Keys & producer Swizz Beatz have confirmed to People that the couple are expecting their first child [together], and are slated to be married in a private ceremony sometime later this year. Swizz is the father of 3 year old Kasseem Jr. with Ex-wife and singer Mashonda, and his oldest son Prince Nasir. Here is a recent pic taken of Alicia on Thursday (May 27) in London for the Keep A Child Alive Black Ball charity. What pouffy dress that is, not sure I am feeling it…No, I am sure, I am NOT feeling it! Check out the glitter & spiked Louboutin pumps fellow Fashionistas!!! Though some people didn’t approve of how this relationship started, children are a blessing & frankly, its not our lives, so congrats to both Alicia & Swizz! Chunky Rings are my new fashion must have! Leeora Catalan especially draws me to a collection from her nOir Jewelry. nOir has been seen on a lot of our favorite celebs, such as; Lady GaGa, Alicia Keys, Madonna, Amber Rose, & Rihanna. I must warn you that they are large pieces, so if your afraid to be bold and flashy, you may want to look for something else nOir offers. nOir also offers earrings, bracelets, and necklaces to add to your personal stash! Alicia Keys "Put It in a Love Song" Cover Art! Alicia Keys has unleashed official cover art for “Put It in a Love”, her duet song with Beyonce Knowles. Like its music video which was filmed in Brazil and has vibrant tone, this artwork also features the R&B singer in colorful shot. Alicia Keys Performance at NBA All Star Game [Video]! Photos from "Put it in a Love Song" Video ft. Alicia Keys & Beyonce! 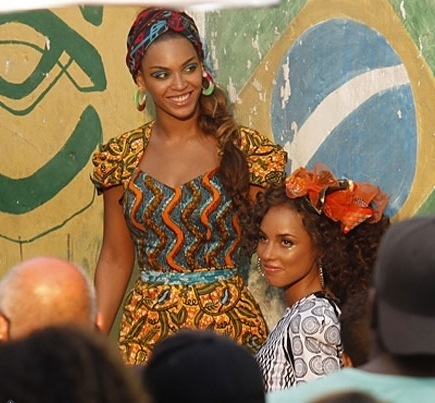 Beyonce & Alicia Keys in Brazil shooting video [Video]!